An ariel shot of the railway line that cuts through this hill. 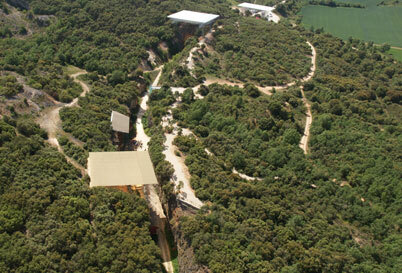 The roofs mark where archaeological digs are occurring where the cave is exposed. Down a 43 foot vertical shaft, another 40 foot slope, and buried under thousands of cave bear, lion and lynx bones, lies the partially fossilized bones of at least 30 individual humans. Welcome to a chamber of horrors otherwise known as Sima de los Huesos (the pit of bones). This pit is but a small part of a large complex of caves discovered during the cutting of a railway line through a hill in northern Spain. Human occupation sites have been found in many of the caves in this mountain system but this pit of bones was no place for the living. This portion of the cave is set far back in a larger cave complex and literally was a dead-end. It appears that even when this larger cave complex was inhabited this pit had no other entry other than the 43 foot vertical drop from which it is unlikely anyone who went down could every come back up. The same would be true for any animals who entered this portion of the cave. 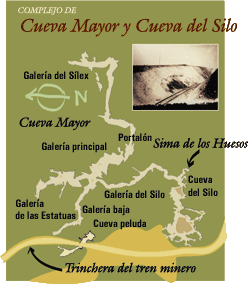 Cave system showing where the railroad cut is (yellow) and the position of Sima de los Huesos in the larger cave. So what is down there? Well, only a small portion of the fossil-bearing layers of sediment and rock have been examined thus far but a gruesome picture has emerged. Thousands of bones representing at least 160 cave bears have been recovered. A few lynx, lions, wildcats, a wolf and a few other small rodents have been found. But the real find are over 6000 human bones representing at least 30 individuals with many more yet to be recovered. Excavation continues to this day and it is expected that the number of human remains found will at least double. Drawing of the Sima del los Huesos (the pit of bones) cave. Site of excavation are shown (eg. A, B, SRB etc..). The original floor of the cave is indicated by the dashed line. Most of the human fossils have been found at the A site at the bottom of the pit. The figure is from Arsuaga et al. 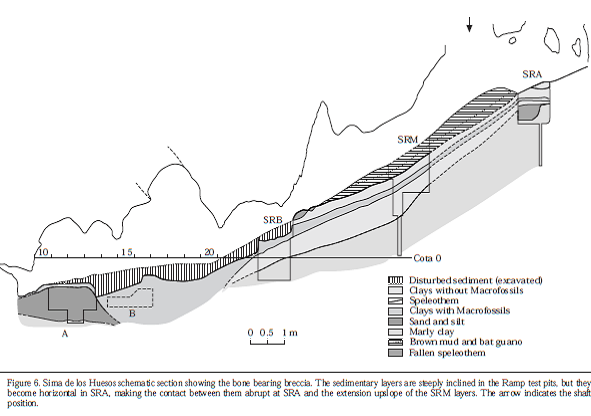 “Sima de los Huesos (Sierra de Atapuerca, Spain), The Site” JHE 33 (1997): 109-127. What’s the big deal with these bones? I was interested in the geological context of these bones because it was a bone pulled from the rocky matrix of a shaft dug at the bottom of this pit that recently yielded a tiny amount of highly degraded DNA. The sequence of that mitochondrial DNA from that bone made big headlines since it was most similar to DNA extracted from a tooth and tiny bone from the Denisova cave in Siberia. I mentioned this DNA and its sequence in my recent article, Young Earth Creationism and Ancient DNA. A couple of years earlier one of the cave bear bones was used to generate the whole genome sequences of a cave bear which showed, in part, that they were genetically distinct from all bear species alive today. There is a good deal of debate about how the human bones came to be in this deep pit. The lack of artifacts (tools or other signs of habitation) tell us that the bones did not come from people living in this part of the cave. The pit has not yet yielded any bones of any prey animals like antelope and deer. All of the animals in the pit are carnivores and so the lack of prey means this was not a den where they brought back their food to eat. Where the human bones dragged there by lions and bears? Although some of their bones have evidence of having been gnawed on by animals this seems very unlikely. It appears that the cave bears and other animals in the cave got there by accidental falls. Maybe they heard or smelled animals that had fallen in the pit and being hungry tried to climb down for an easy meal? However they fell in and once in the cave there was no way out. The many gnaw marks on the cave bear bones suggests that some animals survived their fall and chewed on the bones of post victims as their only source of food until they died and became the source of food for the next victim. But what about the 28 humans that have been found there so far? Right now it is the opinion of researchers that the human bones probably were deposited there intentionally. Was this a body disposal site or was this a site of ritualistic burial isn’t known but the concentration of bones in just this one part of the extensive cave system strongly suggests that simple accidental falls is unlikely. The majority of human remains in this pit are found concentrated in the very deepest portion of the cave under a large pile of rock debris that has fallen from the cave roof over time. Above those remains are large numbers of cave bears and other bones. The picture that emerges is one in which bodies, either alive or dead were thrown down into the pit. The bones of those bodies eventually were washed, dragged by cave bears, or just knocked to the lower levels by future activity to the lowest levels of the caves and eventually buried under more bones and sediments. A cross-section of the pit of bones showing where excavations have taken place and the contents of the layers of sediments. The arrow points to where the shaft leading down in the pit is found. Figure is from Arsuaga et al “Sima de los Huesos (Sierra de Atapuerca, Spain), The site” J. Human Evolution 1997, 33:109-127. 1) The larger cave was formed over time in a large limestone formation. 2) At some point the cave became available (ie. large enough with an appropriate entrance and no longer filled with water) for human and animal occupation. 3) Animals continuously have had accidental falls into this pit of bones but sometime very early on there was a period in which humans “buried” bodies in this pit. 5) Most of the bones in the cave came to rest there after the human remains were deposited there and so represent some time after the last people lived in or near this cave complex. It should be noted that cave bears have been extinct for an estimated 25,000 years. Lions and cave bears have certainly been absent from this part of the word for a long time and so every human bone found in this cave came to be there before the extinction of these species. I would note that cave bears are depicted in a few murals found in caves of Spain and France attesting to the fact that there was a time when humans and these bears lived together. How old are these bones? I briefly mentioned in my article on ancient DNA that it was estimated by conventional dating methods that the human bone was around 400,000 years old and the other human bones are estimated to all be of similar age. Some cave bear bones have been estimated to be as old as the humans but they cover a range of several hundred thousand years suggesting accidental falls only happened very rarely. The fact that most of the human bones are all of a similar age is another reason that it is thought that something other than accidental falls are the cause of their presence in this cave. The cave system is thought to be many millions of years old but only been available for habitation since about a million years ago. After the global Flood of Noah’s time, about 4,350 years ago, the human gene pool, which had begun around 1,700 years earlier with Adam and Eve, was whittled down to 8 people. Their descendants eventually dispersed from the Tower of Babel. Though they were all related, once they became isolated and in some cases reduced to small groups, distinctive traits would have emerged—characteristics that we now associate with the fossils of various “archaic” (i.e. ancient and extinct) people, who were nevertheless fully human. That they were fully human might well be the case but that humans found their way to this cave in Spain less than 4000 years ago and some of them found themselves buried under debris in the bottom of a pit in the back of this cave system is very difficult to match up with the geological setting of the bones in this cave. This proposed young age would also be challenged by my point from the previous article (YEC and ancient DNA) that the DNA in these bones was extremely degraded despite reasonably good preservation. This is indicative of the bones having laid there for a very long time. I should also add that there are hundreds of bones that are dated 10 to 20 thousand years old from caves around Europe for which DNAs have been extracted and sequenced that are in far better condition as one would predict from the dated ages of the bones. These DNA sequences were found to be well within the limits of variation of people living today while the DNA from a bone in this pit lies far outside the variation of any people group alive on Earth today. I would think that Mitchell would predict that those other cave dwellers that must have also represented the first migrants from the Ark would also have divergent DNAs like the Neanderthals and Denisovans rather than simply looking just like us. This point is worth exploring a bit further but that will have to wait for another day. Carretero, José Miguel, Ana Isabel Ortega, Laura Juez, Alfredo Pérez-González, Juan Luis Arsuaga, Raquel Pérez-Martínez, and Maria Cruz Ortega. 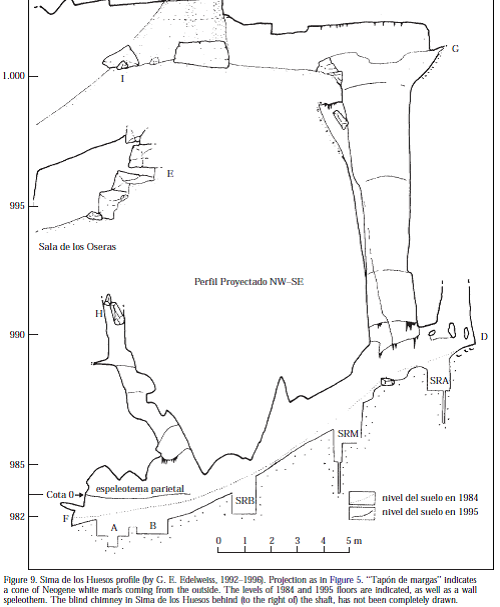 “A Late Pleistocene-Early Holocene archaeological sequence of Portalón de Cueva Mayor (Sierra de Atapuerca, Burgos, Spain).” Munibe (Antropologia-Arkeologia) 59 (2008): 67-80. ” To top it off analysis of those DNA sequences reveal that they are not radically different from living humans like this bone in the pit of bones but rather all those bones that have been sequenced fit right into the variation of people alive today. ” I found this difficult to follow. I think you mean “To top it off, analysis of these more recent DNA sequences reveals that, unlike this bone in the pit of bones, they are not radically different from living humans, and indeed lie within the range of variation of people alive today. ” It’s the possibly ambiguous referents of “those” and “like” that threw me. Thanks Paul. I really appreciate the advice on the writing. I have reworked the last couple of sentences.